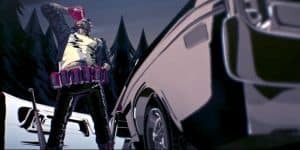 Travis Strikes Again: No More Heroes Might Be Switch Exclusive | Nerd Much? Travis Strikes Again: No More Heroes will be taking full advantage of the Switch's many innovative features. In a recent interview with DualShockers, the series creator of No More Heroes Goichi Suda (otherwise known as Suda51) talked about the many advantages of releasing a game on Nintendo consoles. Suda says that Nintendo is always innovating, that there are always new features and hardware that no other console maker has done before. As example, he states that the Wii controller is what inspired the beam katana of No More Heroes. He certainly isn’t wrong, Nintendo has always been at the forefront of gaming innovation, even when some of those innovations fell flat. The Wii motion control may have worked well for No More Heroes, but I will never forget the headache that Skyward Sword was. Luckily for the Switch, the controls are more precise and only 1-2 Switch takes advantage of all the motion and haptic features. Nonetheless, Suda couldn’t express his love for the new Nintendo console enough, calling it “by far the most punk.” Each new feature is a challenge to Suda on how to convert and use them properly within his games. They are revolutionary challenges that drive Suda forward to make more interesting and dynamic games that other consoles cannot provide. In fact, Suda wants to assure fans that Travis Strikes Again: No More Heroes will be taking full advantage of the Switch’s many innovative features. Hopefully without all the awkwardness of the 1-2 Switch. With all that said, it was only natural to ask Suda if Travis Strikes Again will be an exclusive to the Switch. The original game, No More Heroes, was a Wii exclusive for three years before it was revamped for the other consoles as No More Heroes Paradise. But the second in the series, No More Heroes 2: Desperate Struggle, will be staying a Wii exclusive since Nintendo pulled the support plug on the console. But what about Travis Strikes Again? Suda quickly responded with a “yes,” then corrected himself with a “maybe.” So he clearly wants it to be, but as a developer the more people see your game, the better. No More Heroes: Travis Strikes Again launches on Nintendo Switch sometime in 2018.